Welcome back to Houdini’s Cornucopia of Extremely Helpful Guides. In this article, we’ll talk about the good old slug-fest everyone knows and loves – lol top lane. Throughout the meta, the top lane has had a grand diversity of roles that can participate in it and do well. Bruisers, Marksmen, Mages, even Teemo has called this lane home every once in a while. 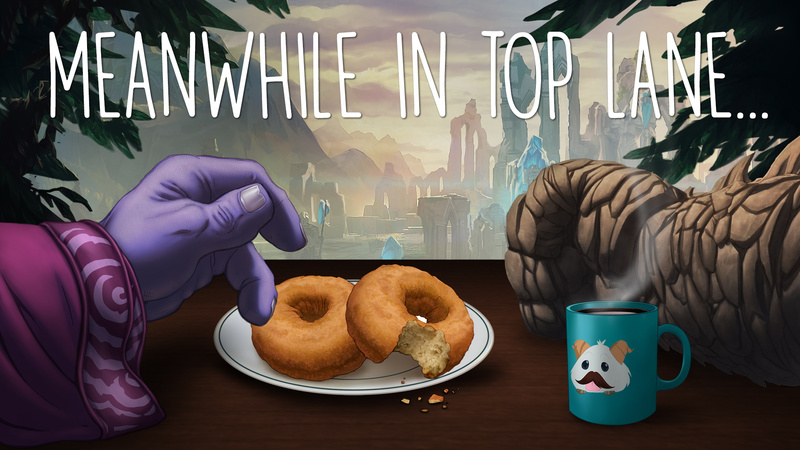 In short, this variety of champions means that if you chose to make top your main, you’ve potentially got the widest range of tricks up your sleeve. Or perhaps your sleeves are really wide and can fit many tricks. Or maybe you need to see a tailor, either way, diverse picks. Regardless of what you decide, whether you’re looking to be a stable tank and teamfighter, a split-push monster, or something else altogether, you’ve chosen the right lane. Welcome to LoL Top Lane. Top lane comes down to three major factors. Skirmish ability, lane management, and all-in potential. In the case of skirmishing, we’re referring to the back and forth trading that occurs without death, but serious threat of it. Lane management, in general, is straightforward, and if you combine the ideal with skirmishing you come across a powerful tactic; zoning. Above all else, worship gold throughout any means, and do not ignore the most trivial of a gold source, even every ward you kill counts. A split-pusher with gold splits better. A tank with more gold tanks more. Of course, this means spent gold. The gold does nothing in your inventory, use it. A few waves of minions can be considered equal to a kill in terms of gold, and gold wins games. Remember this wholeheartedly. Top lane in the LoL is synonymous to a house, more so than any other lanes. In this case, the early game is the foundation of the aforementioned house. Naturally, a shifty foundation will lead to devastation. In a straight up 5v5 teamfight, the tank that dies first spells death for his team. The same goes for a split-push related game, if that 1v1 comes down to a 1v0, your base won’t last long. Each member of the team must pull their own weight, each supporting structure must hold up their own portion. Remember that in top lane, ganks are mere band-aids, you still must be able to deal with your opponent in a one on one, whether that be through victory, sponge-strategy, or Shen‘s passive-aggressive avoidance tactics that everyone knows and loves. Why is this so important – Top lane lol? It has to do with the inherently isolated nature toplane is always subjected to, where advantages and disadvantages are exemplified. We’re talking everything under the sun, level two power spikes, level six ultimates, completed items, anything and everything used to change the name of the game is fair game. Identifying each and every increase, decrease and especially spikes is paramount in playing top. A Riven with a Doran’s Blade is different than one with Boots and Pots. Leave no bloody stone unturned. Leave no minion un-cs’d. Leave no bush un-facechecked. Actually, scratch that last part, do not check all bushes with one’s face. It is not my place to provide you with all the information. No guide can prepare you for everything, but I’ll damn well try to give you a brief snapshot of the obstacles in your path. With that out of the way, let’s role. The beginning of top lane starts immediately when the game begins, as do all other roles. Check if your jungler needs a leash, and defend your jungle from potential invades. Tab up and make a note of summoner spells and keystone mastery. God forbid you to stand in Fountain with your thumb up your counting Poros and zoning off. If your team is invading, make a point to join them, but remember to recall before a minute passes or else risk showing to lane late. Depending on the champion you pick, and the match-up you are in, right off the bat you want to know whether to push and pressure or not. If you’re in a losing match-up across all levels 1-5, secede the lane if the enemy makes a hefty show of force. If you’ve got Corrupting Potion, and the enemy does not, in such a case as Irelia Vs Teemo, you have some room to maneuver. Remember that while Corrupting Potion increases your effective health, it does not increase maximum health. This means that you must trade, bide your time, trade again, and wait for the time to all-in if you so choose. While in theory, Teemo has the early lane dominance down pat, proper skirmishing can ruin his plans until Irelia gains access to all of her abilities. This matchup is an exaggeration, but all matchups follow a few universal truths, a few listed here. You need to take this type of information into consideration before the lane even begins. It will help you make the right decision when it counts, queue cliche “knowing is half the battle” quote. The stronger lane bully CAN control the lane and the flow of the minions. Whether this be through pushing and forcing missed CS at the turret, or freezing and punishing, the stronger lane bully has the right of way. If they choose the wrong direction or make a mistake, the other has a chance to challenge, but often only then. Prime examples of lane bullies are Gnar, Rumble, Swain, Darius, and Irelia. The stronger global presence has more effect on the map. This need not be explained, see Shen. The stronger split-pusher will win the game if both teams are at a stalemate. This is seen as often in pro-play as it is in SoloQ. Tryndamere, Fiora, Jax and if given time even Nasus can gain an inhibitor for their team and more if given the chance. This is unlikely to happen, but the threat is often enough to force teams into making decisions, good and bad. This is the top of the iceberg, but generally the most important subjects to approach at the beginning of the game. Win conditions are where it’s at. If you’re playing Maokai top, don’t expect to outright beat a Tryndamere unless he makes a mistake, but if he does, have no mercy. Do that which is the most gold efficient, but also the safest. I won’t go into risk-analysis quite yet, as that’s a guide for another time, but in short, know your win conditions. Don’t attempt to out-bully in a match-up you know you lose, you’re just asking for trouble. The mid-game is full of rotations, ganks, rotations, and even more rotations. Behind a strong meme is an even stronger truth(TM). In this stage of the game it is important to see exactly how much pressure is being exerted throughout the map, whether it be your team or the enemy’s. Beware of overflow. I’m coining the term right now, this second. Overflow occurs when a person within a team is able to expend less resources for the same effect, and thus frees another member of the team to act elsewhere. The strength of overflow cannot be underestimated. Imagine the following. If the enemy bot-lane has pushed in the bottom turret and destroyed it before your team, it’s likely that lead will be pushed elsewhere. Barring that juicy turret first blood gold all the new-fangled kids are getting into these days, simply destroying that turret changes the lane dynamics. It’s more likely your allies will play more passive, as they have no defensive structures nearby, but who in the world knows what the enemy could do to push their newfound lead. Go kill jungle monsters? Freeze the wave? They could come up to top, but more then likely they’ll rotate mid, creating a 3v1 disadvantage for your ally middle. Your team responds, jungler and support go to middle, as your ADC is still busy clearing waves bottom. Do not be surprised if the enemy jungler suddenly shows up to your lane. If you are, you weren’t paying attention. The same applies to you, however, overflow can be used advantageously as-well. If you’ve got a lead, don’t hesitate to freeze your lane, remember, top lane is unusually isolated and volatile. That lead you’ve got should be kept, and if you can, extend it. The quickest way to lose a lead is to make the assumption that simply because of your lead, you will win. This makes you an easy mark to bait, and thus gank. If you know you are in the lead, chances are the enemy knows it too. Contain your lead, press it when you know you can, and be cognizant of any and all effects on your lane. Junglers, mid-laners with Teleport, Twisted Fate, Pantheon, Nocturne. Out of sight does not mean out of mind. I hope the same applies to the basics presented in this guide. Play to your champion’s strengths, and to your enemies’ weaknesses. If you happen to be battling a champion without any crowd control, know that teleport ganks will be easier and more effective. If you can step on Zac‘s blobs, do so. If Vi‘s passive is used up, it’s time to stack on some damage. If Swain just finished using his ultimate and is low on mana, use yours. No words describe the constant to and fro of LoL as much as Newton’s “Every action has a reaction.” Of course, in this case it is “Every action should have a reaction.” Whether that be running away because “good lord Wukong just ulted me again” or going in because that Malphite just missed his ultimate, do something. There’s no better way to learn. Besides this guide, of course. If you’ve got a split-push champion like Fiora or Jax in your hands, do everything you can to get that 1v1. If you’ve got a lane bully, bully that lane! What you see following is an ideal team-fight. The back-line provides the damage, the carries of both teams are evenly spaced across so as to be able to constantly output damage. The arrows symbolize directed damage, the blocks people, a simple diagram by any means. This is an even fight, five red arrows, five blue arrows. Below is the most unnoticeable travesty to occur in war tactics, starring the unused soldier and the oblivious tank. As a top lane tank, it is your objective to assure that you are properly spacing, positioning, and assisting your team. Anything you notice? That’s right, Red team’s damage output is missing some vital components. Five red arrows, check. Five blue arrows, missing. Now, the most important, who is at fault? Regardless of how it happened, whether the backline was too slow, or the frontline too fast; the clear victor is the blue team. If your goal is to win, and I believe it is considering you’ve slogged it through this wonderful guide, in the heat of the matter does not matter who’s fault it is, but it must be fixed as soon as possible. There’s a few ways to do this. 1. The tanks on red team retreat. 2. The Red team backline advances as soon as possible. While this might be obvious, red team has been put at a disadvantage. In those vital seconds used to re-position, Red team tanks have likely taken far too much damage to sustain a proper fight. TL,DR: As a tank, do not isolate yourself from your source of damage. Now that you’ve got the basics, let’s expand just a tad. 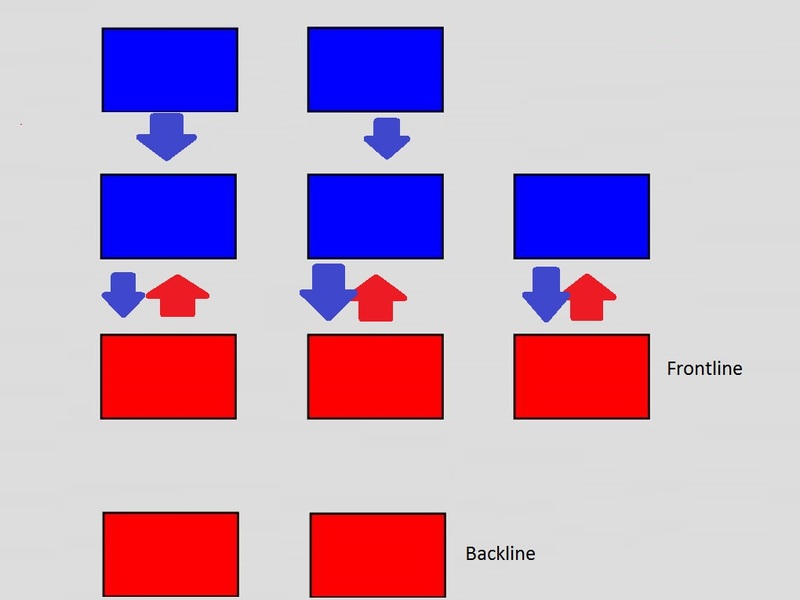 Basic tank theory implies that both backlines will be forced to target the respective frontlines. If, for example, an enemy champion has a gap closing ability which allows them to pass by the frontline to target the backline, say, Leblanc, it’s a tank’s job to run interference. If you, as a frontline, cannot kill and may be killed or kited by the enemy backline, you cannot engage. If you choose to do so, you run a high risk of encountering situation two, the Isolated Frontline. Choose to peel your own backline, or at least be ready to. A tank that overextends will receive no damage from his backline, and thus ultimately lose. Remember, the entire goal of a teamfight is to win. As in, destroy the enemy nexus. Tanks are re-known for having low sources of damage, but Marksmen and Mages can shred through turrets like it’s their job; because it literally is. It’s sad to say, but an ideal teamfight for a tank is one in which he’s limping away from the battlefield, bleeding profusely, only to recall and join the fight once more. 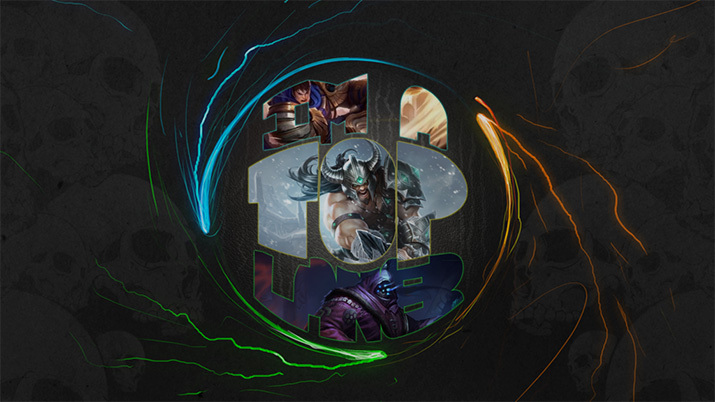 Top lane is a volatile trench war with no holds barred and where everything’s fair. No “cheap” tactic is overlooked, and there’s little to no jurisdiction besides the claims of the victor. I hope that this guide has given you a quick peek at what it takes to master the rudimentary elements of top lane, and fear not, there is more to come. Join me next time on a comprehensive in-depth guide to the elusive meta of the top lane. Hold on folks, it’s on the way. Nice guide, i would try to follow it in practice. TY for your work. Very detailed guide, I always follow these tips, when I’m playing as any top lane champion. But sometimes it is so hard to predict moves of my enemies. I feel like I need much more practice against various top laners. The top lane has the most intense early game in League. And this is really cool. I have been challenger since season3, helpfull guide definitely shows the basics of the toplane. I would recommend making a part 2 where you zoom in on the top lane tactics, as well as split pushing with larger objectives (like baron/elder). This would help the somewhat higher elo’s aswell. Still a very nice guide, should get you to platinum if the guide is followed correctly.